I'm sure you've heard the saying, "if you don't lose it, you lose it." 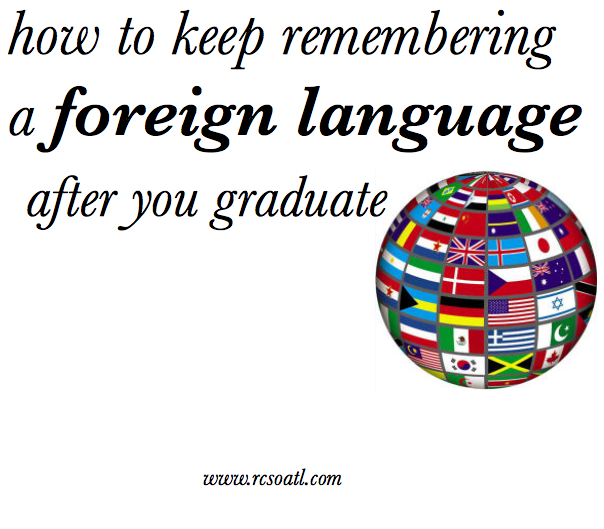 Well, it's definitely true when it comes to remembering a foreign language. I started learning Spanish in elementary school, took classes in high school, and minored in Spanish in college. I even studied abroad in Spain two summers ago, and became fluent in the language. So imagine my panic attack when the other day I couldn't remember how to say a simple phrase in Spanish. I hadn't been using my Spanish, and I was starting to lose it. I've heard way too many stories of older adults saying how they "used to know Spanish/French/Italian/German, but stopped using it and completely forgot the language," and I don't want that to happen to me! Do you know another language besides your native language? How do you keep up with it ? These are all great pointers! It's been years since I've been able to speak conversational Spanish & French. Maybe I should look into a refresher course and then put your ideas into action. This is great advice, I took Russian since elementary school but once high school ended I stopped and I've forgotten so much of it! I regret it now. I end up commuting an hour round trip to and from work, so I'm thinking about getting some of those cheesy CD's and working on it a little each day. those are great ideas! And I'll have to check out that app, thanks! Vett, that is so awesome! I didn't know you knew Spanish fluently! You go girl! If we arrive to 200clicks, we can get the clothes, thanks!